My friend Danielle is both creative and frugal, two qualities that are near and dear to my heart. She’s also very talented and finds ways to do it all while staying within a budget. 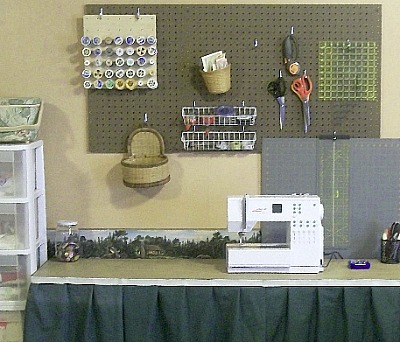 I asked her to share some of her best tips for saving money on sewing projects and supplies. I love her advice and I know you will too! Ugh, hobbies. Am I right? We love them, we love having them, but man, can they be expensive! I’ve been there. I have been sewing for roughly 26 years (I’m 30 now, so count my early years how you will…), and I sewed as a professional to help pay the bills for about 6 or 7 years. (It wasn’t until about 4 years ago that I started to take on far less work because I just didn’t have the time or motivation anymore.) And through all that time, I have been in varying financial positions and have learned a lot about frugal sewing. 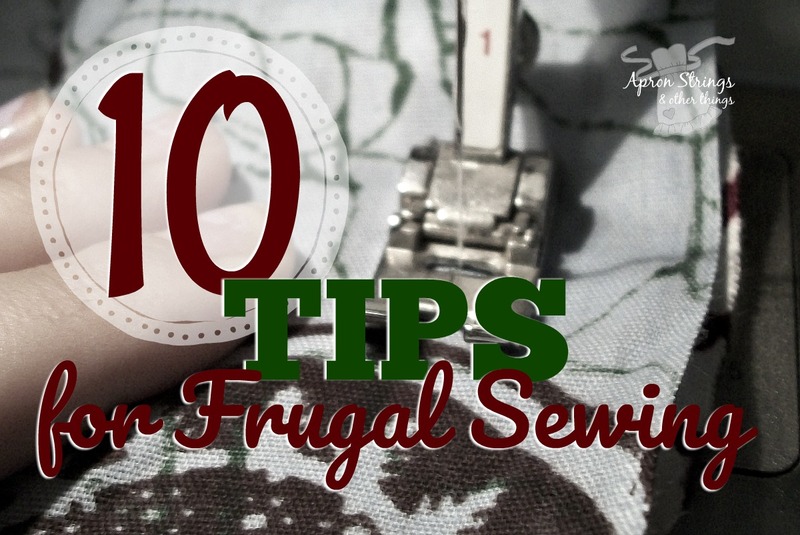 Without further adieu, here are my top 10 tips for frugal sewing! Make friends with people who sew or used to sew. Crafters are generous. They hate to see things go to waste. And when somebody has to give up their hobby or downsize for some reason, they are thrilled to pass it along to somebody who will care. Make friends with a volunteer at a thrift shop… they can’t sell all of the items that get donated, so sometimes they can pass useful things along. I have gotten a decent number of useful items this way. Join a quilt group or sewing group… most have fabric/supply exchanges. I used to be a member of a quilt guild, something I just don’t have time for at this stage of my life, but when I did, I went to the monthly meetings. People (myself included) would bring fabrics that they just were never going to use, sewing magazines, and tools for sewing that were just no longer needed. Sometimes there would be lots of great stuff, and other times… not so much. The rules were that you could bring anything to give away, but at the end of the meeting, whatever wasn’t taken, you needed to bring back home with you (or donate somewhere else). You could take anything that you wanted from the sharing table, and you didn’t have to have brought something in with you to be able to take things. The point was to keep things from being thrown out and also to help others find things they may need. Ask for supplies, tools, and materials as gifts. No, seriously. I mean, I really do enjoy flowers and chocolate and clothing, but honestly, I REALLY love getting things I need. I get excited in a very nerdy way about being gifted sewing needles and good scissors or a beautiful piece of fabric. And I have to say, once you truly “get” sewing, I don’t think you can NOT get really excited about something like that. Search rummage sales and estate sales and second hand stores. Think like Grandma, or Great-Grandma, or Great-Great Grandma…cut useful scraps off of off old clothes or sheets, save zippers that aren’t broken, buttons, elastic that’s still elastic (but not curled) and save for future use. 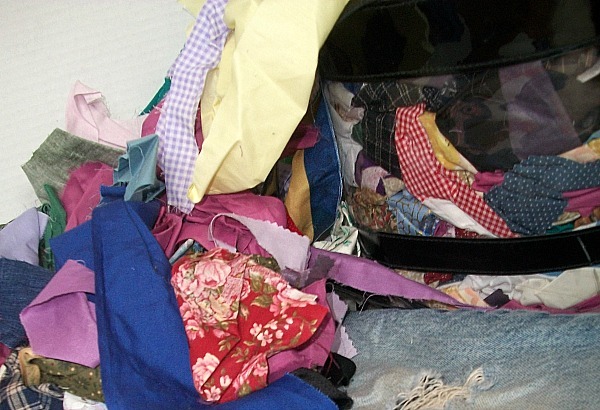 Helpful hints: Keep a bin for zippers, one for buttons, one for elastic, and keep a box for scraps of fabric. Save portions of old jeans that aren’t worn out or that no longer fit or are no longer in style for patching. Think outside the box. Making a quilt? You can get flat cotton sheets at Walmart for a steal, or from a thrift store. You know those small fleece blankets you can find at most stores these days for just a couple of dollars? Use them for batting…or the fuzzy ones can double as batting and a backing for a quilt. Or use the fleece to make hats and scarves and mittens. Don’t forget to get creative. There are cute throw pillows out there with covers made from old shirts, aprons, or aprons made from jeans…darn, my mom made me an apron for butchering chickens out of a woven plastic feed bag, and she made me a grocery bag out of one. Come to think of it, I could use a few more of those…Mom, you up for the job? 😉 And towels. I just did a post for my sewing series on how to make a painted pillow cover, and I used some flour sack towels I picked up at the farm store for $0.99/eat on sale to make them cover. Shop the clearance sections. Stores like JoAnn’s and Hobby Lobby, and even quilt shops, periodically have things on clearance, and at least near me, the Walmarts in our area occasionally clear out products that have “old” packaging on things like batting or pillow forms. And “remanent” cuts of fabric are nearly always sold at a fraction of the price compared to the original. I’ve found cuts of fabric just over a yard this way and saved loads of money on more expensive fabrics for special projects. Join free member programs at places like JoAnn Fabrics. They send you fliers with the latest sales, and coupons for certain products, plus they usually throw in a 40% off coupon for just about anything in the store. A few times a year, they have deeply discounted prices on different things… Pre- Christmas, it’s always flannels and fleece. Same thing for Hobby Lobby…go to their site and print off the 40% off coupon before you go to the store, and pay attention to their sales…everything is 50% off at some point in time, and it’s usually cyclical. Oh, and some craft stores, like JoAnn’s, offer additional discounts to teachers or members of special sewing groups that are signed up for the program. As a homeschooler, I can sign up as a teacher and we can receive discounts when we shop. When I was a member of the quilt guild, there was a special card we got that gave us an additional discount on purchases. Sometimes you can combine sales and coupons with those special cards, sometimes not, but they are well worth having. Going back to thinking outside the box and thrift shops…how about making pillows or stuffed animals? Again, Walmart always has a super standard bed pillow for less than $3, but if not Walmart, then a lot of other stores will have great sales on bed pillows at least once a year. Use the stuffing to fill your own projects. Thrift stores are also a great place to look for pillows, especially throw pillows. A throw pillow almost always has a pillow form in it (it’s just super basic fabric like a thin white cotton or polyester or even a webbing filled with stuffing), and even if it doesn’t, you can make your own pillow and just remove the filling from one and put it in the next. Are your bed pillows wearing out? Wash them well, and save the cleaned filling for future projects. Shred the filling, or loosely pull to re-fluff the fiber. Remember that repurposed fill has a tendency to get lumpy with time. The more you stuff your project, the less lumpy it will get. I have made dresses, pajamas, and table cloths out of old bed sheets, and yes, I even went “Julie Andrews” in the sound of music and made some clothes out of old curtains! Sheets and curtains are typically less expensive than buying fabric by the yard, and sometimes I have better luck finding something I like or need when I think outside the box. One last tip: sometimes when you want to be truly frugal, the best thing you can do is to buy the right supplies to begin with (or at least as you can afford them) and make good investments. Cheap tools (I’m not talking second-hand) can sometimes cause more headache or damage than they are worth. Brittle thread will just cause you to rethread your machine a lot and create broken seams down the road. And materials that you do NOT like (unless intended for a project for someone who will like it or for something that is not pretty) are not worth hanging onto. A dull pair of scissors, or scissors that are not solely devoted to cutting fabric and thread will make you want to hate sewing, and potentially cause you to mis-cut your fabric or damage your fabric in the process. A sewing machine that doesn’t work well doesn’t serve anybody well. Looking for frugal ways to store your supplies? Empty glass jars from pasta sauce can hold buttons and zippers, a shoe box (cardboard or the inexpensive plastic ones) can hold ribbons and scraps of fabric, or be turned into a sewing basket. With the all of the dollar stores in existence, it probably won’t be too hard to find extra storage containers if you really need them. The plastic bags that comforters and bed sets come in can hold larger cuts of fabric or batting or stuffing/filling,or partially completed larger projects. And if you don’t like plastic, there are plenty of other free cardboard, glass, and metal containers out there waiting to be reused. After all, just because you might need to be a pack rat to be frugal when it comes to sewing, but that doesn’t mean you have to be a disorganized pack rat! 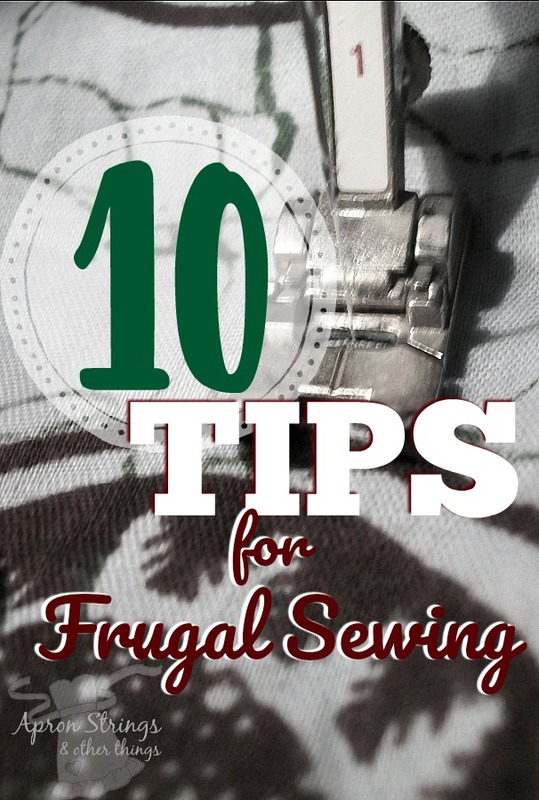 I would love to hear your tips for staying frugal with your sewing addiction! And if you are looking for more tips or wanting to learn more about beginner sewing, check out my sewing series over at Spring Lake Homestead filed under sewing! 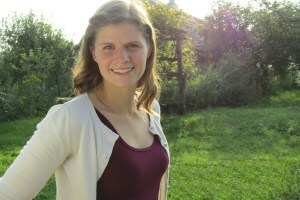 Danielle is a homeschooling, homesteading mother of 5, and wife to her husband Scott. Prior to ever dreaming about homeschooling or homesteading, she had a love for sewing. A former seamstress, she now tries to sneak in time to sew things like cloth napkins while the kids are napping or playing, and occasionally makes a project to help teach others to sew for her blog posts. Oh my goodness!!! I LOVE this post Linda! What wonderful tips Danielle has. I’m absolutely gonna check out her sewing tutorials… thanks so much for introducing us to this wonderful resource. I love Danielle’s tips! Thank you for stopping by and enjoying her visit today – I know you’ll enjoy her tutorials. Have a fabulous week, Michelle! What great tips! I think many of them would apply to other hobbies as well. She did a very thorough job of giving frugal advice. It makes me want to do more sewing! Michelle and Linda, you are both so very right! We save broken things all of the time around here for parts! I believe you could use a teacher’s discount card for a place like JoAnn’s to save on craft supplies beyond just fabric, and I think crafts are something a lot of homeschoolers, especially with young children, tend to do a lot of! Love Love Love these tips! Going to incorporate some! I never thought of using the stuffing from the insides of a clearance pillow! I’m in the middle of a t-shirt quilt, and love the idea of using fleece as the filler/batting. Have so much that I snatched up on clearance at Joann’s. Plus – another place to look for fabric – IKEA’s 50% off room. I just nabbed 2 curtain (lined) panels (57” x 98”) nice & thick dark grey ones for $5 EACH! 🙂 I have a duffel bag pattern I’ve been meaning to make, and the curtain lining can be cut out and reused for interfacing, etc. I just saw a huge canvas tarp at Harbor Freight for $4.99 – I think I’ll go back for that one to add to my inventory. thanks so much, Debby, for stopping by and sharing your comments. Danielle’s pillow tip is brilliant, and it looks like brilliant ideas are contagious, with all the ideas you are sharing, too! Happy Creating! Debby, I am so glad you shared your tip about the curtains! I’ve done that a few times in the past, but didn’t even think about it for this post. And I’ve definitely used tarps for projects before. It’s amazing how much money you can save on a really large, nice piece of material because it comes in the form of a curtain or a bedsheet (or a tarp)! This was a great post! I always keep and eye out for old clothing. I’ve gotten thrift store items for the zippers and buttons because the are unusual or just cheaper that buying them new. I’ve used old jeans to make new for my grandchildren. Mattress pads make great linings for winter coats and coveralls. Some furniture stores will give you their old samples, make great bags, and even shoes. Wow, great ideas Debbie! I’ve seen people use furniture store swatches before. Some ladies that are a part of the quilt guild I mentioned saved all of their selveged edges cut off from their fabric to make a neat pencil/storage pouch… waste not, want not! Great tips! Thank you for sharing your friend with us! thank you, Christina 🙂 I love helping friends meet new friends. I hope you are having a fabulous week! Glad you found us 🙂 Sometimes I wish I had even more patience for teaching my kids! It’s not always easy, but it sure is a blessing! Some wonderful ideas here. Makes me want to spend time sewing today. Thanks for stopping by, Lori! We are having a rainy day in our neck of the woods, which really sets the mood for staying in and working on a project, so maybe I’ll be sewing too 🙂 Enjoy your weekend! Glad you enjoyed it and glad it got you wanting to sew! Fantastic frugal sewing tips! I always make sure to stay on the mailing lists for our favorites like AC Moore, Jo-Ann’s, and Hobby Lobby, since they always put out great money saving coupons. Thanks for sharing! The mailing lists are fantastic, though they can be a tempting lure to spend more than you have! I usually have to tuck mine away some place where I’ll know where it is but won’t look at it so I’m not tempted to spend money I shouldn’t! Love these tips! I’m not a sewer. However, my seven-year-old daughter decided she wants to be. So we’ve been learning some basics together and it’s fun watching her grow in a talent that’s hers. These tips will help us find more practice material without spending a fortune, so thank you. I’m so glad your daughter is taking the initiative and working on her sewing skills – I know she’ll amaze you in the years to come! My daughters have, and it’s exciting to see their creations. 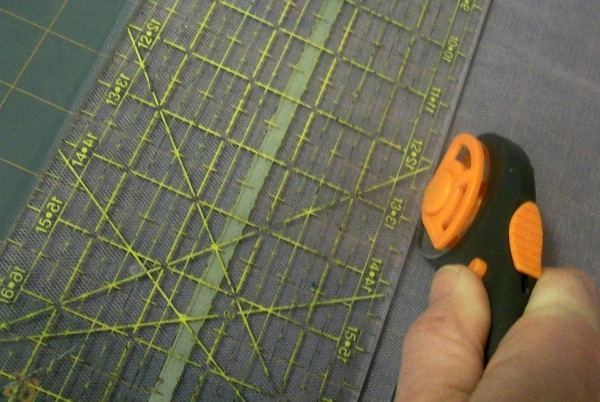 Glad these tips were helpful to you – happy sewing! So glad these are helpful! The cost of getting into a hobby like sewing can be so prohibitive, so it’s great to find ways to get creative, especially when you aren’t sure what kind of results you may be getting! These are great tips. I have been teaching my daughter to sew and will have to remember some of these for letting her practice. Yes! These are great things to remember when you are sewing with little children! I let my kids play with my scraps and don’t feel bad about letting them use fabrics that I’ve collected but might not be my favorite. You give some great ideas on how to get materials and education! I will add one more idea of how to get materials. If you or someone you know goes to auctions, you can often find them there. We have found many totes of new, never used yarn and fabric with store receipts kept nicely in plastic storage containers at an abandoned storage unit auction that was owned by a woman who died in a nursing home and had no family to claim her stuff. yes, estate auctions can be a great source, as long as I don’t get sucked into bidding wars or buying other things I don’t need! I have also picked up some quality fabric and yarn this way. Thanks for sharing!